At the time Bill Borland purchased the rights to the Nevada & DieCard molds (c1991) he probably also purchased a large number of blank chips from these molds. He may well have subsequently had further supplies made by Atlantic Standard when that initial stock was depleted. Borland also apparently purchased the hot-stamp dies used by a number of casinos that were either closed, or had changed the style of their chips since the dies were used, in order to hot-stamp the blanks at his store. Borland then proceeded to hot-stamp the chips himself for sale to collectors. Quite why Borland chose to counterfeit the particular chips he did may always remain a mystery. It may just have been that these were the only dies he was able to purchase. 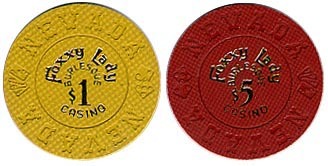 It is possible that his original intention was to sell these chips as 'souvenirs' in the same manner as the 'Fantasy' chips he had made by Atlantic Standard on the same molds (see Borland Fantasy Chips article) but when he saw the rate at which his chips were selling he 'changed his mind'. 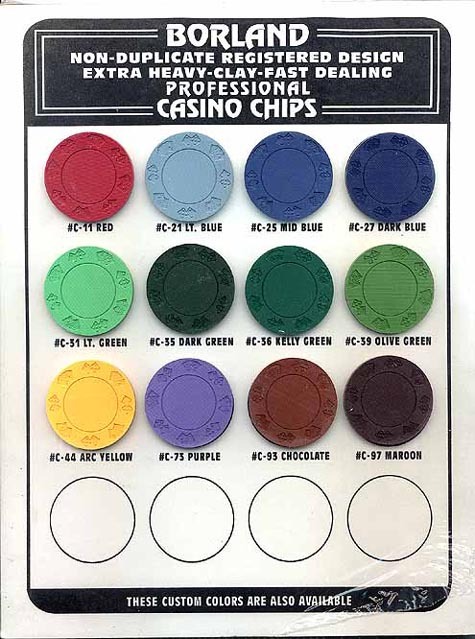 These reasons I have given could help to explain the fact that where actual existing chips were counterfeited, the originals were not of great rarity, and some chips that already existed on the 'Nevada' mold were re-produced on the 'DieCard' mold and vice-versa. 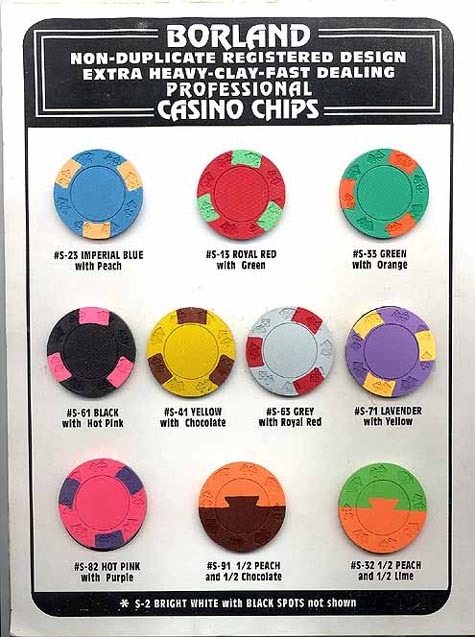 Whatever the real reasons, it is safe to say that Borland made the chips (this has been verified by an un-named ex-employee) and that with the exception of the Hotel Nevada (see the notes accompanying those chips below) he made them as counterfeits. With that exception, all the chips Borland made were from casinos that were closed prior to him purchasing the rights to the molds. Counterfeit chips are invariably found in mint condition. 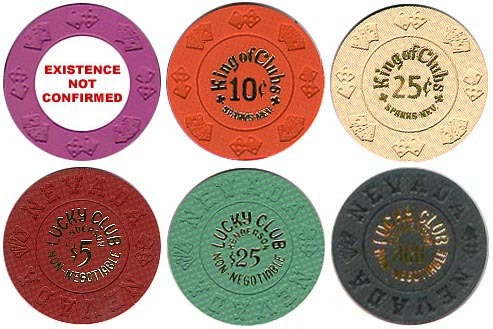 Where an existing chip was copied the chances are that it will show signs of wear from use in a casino. 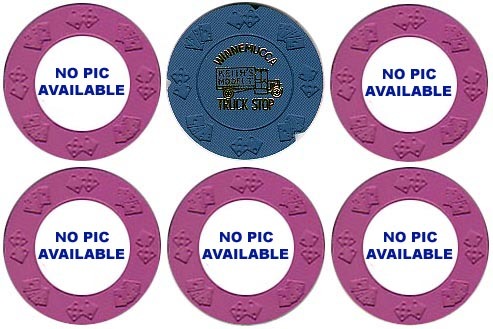 In some cases the color of the chip body is slightly different to the original chip that it matches (as the pictures provided are from different sources and cannot be guaranteed to represent 'true color' I have made no comparisons below). On many if not all of Borland's chips, the hot-stamping is in a slightly darker gold leaf (bronze?) than the original chips. The last thing to note is 'alignment'. Borland took great care in making sure the hot-stamping on the vast majority of his chips was correctly aligned ('medal alignment'). 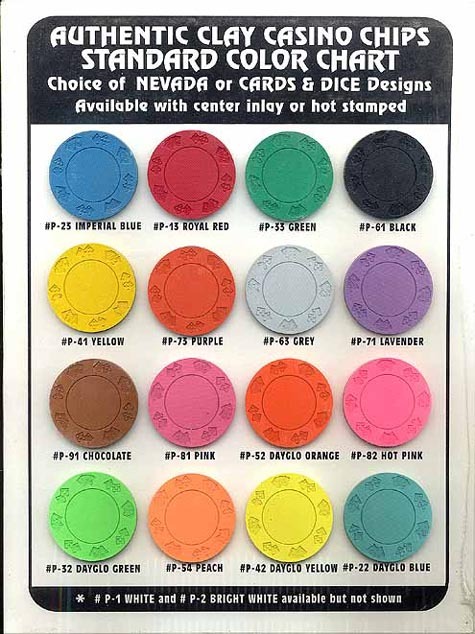 That is to say on the 'Nevada' mold chips, the word NEVADA appears directly at the top of the chip, and in the case of the 'DieCard' mold, the 2spot/5 spot dice appear at the top. This alignment occurs on both sides of the chip. Legitimate hot-stamps will not normally be so aligned (unless it happened by accident). Even given these notes, one will appreciate that it can be extremely difficult to tell whether you are looking at a legitimate chip or a counterfeit. In particular one has to remember that hot-stamp foil would have been available to Borland in various colors, re-orders of blanks may have come in fractionally different shades and some of the chips may not be exactly aligned as Borland's employees would have gone blind trying to perfect them all! So far, 55 different possible counterfeit chips have been identified along with the 3 genuine (Hotel Nevada) chips Borland also produced. They are listed in the tables below with pictures where available. The information contained here has been provided my many sources and acknowledgements appear at the bottom. Where there are no pictures, the existence of the chip has not been confirmed by the editor. All but one of these issues are listed in TCR (The Chip Rack) and annotated with notes (003 & 004) which appear at the back of the publication. Some of the issues pictured have not yet been conclusively proved to be Borland's work and are annotated accordingly. I appreciate some aspects of this reference may not be conclusive to everyone and therefore welcome any additional substantive information that can be provided. 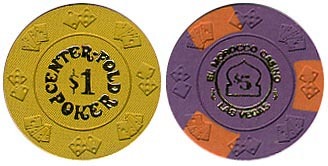 The El Morocco chip is the only example of Borland hot-stamping a chip with inserts. Previously listed as (14) & (16), the orange Flamingo Capri 'matchplay $2 for $1' NCV and the 25c navy are not Borland counterfeits and have been removed. The Hotel Nevada is the only casino for which we know Borland actually supplied 'real' chips. Following the discovery initially of a 25c example, it was noted that the Hotel Nevada was (and still is) open after Borland had acquired the molds. Subsequent investigation revealed that the the Bud Jones salesman for HN had never supplied that chip and the Hotel Nevada were able to confirm the chip was purchased from Borland. Borland had to have had a die made to fulfil this order as the chip is slightly different to the one that was already in play. 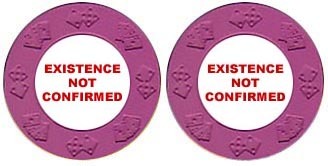 Although it hasn't been possible to confirm with certainty that the $1 and $5 values that he made at the same time were also an order for the casino rather than 'counterfeits', all evidence suggests that Borland did not counterfeit the chips of any open casino and that all 3 Hotel Nevada chips are 'real'. In either event it is probably also fair to comment that there is no way of knowing whether Borland made 'extras' of any of these values for 'his own use'. The Model T Truck Stop appears to be the least seen of the series. Whilst the existence of 6 values is positively confirmed, research yielded this one notched example only. Whilst 'attributed' to Borland, no evidence has been provided that the Silver Slipper chips are in fact Borland's work, or indeed counterfeits. Although listed in TCR, the editor is unaware of any evidence that the Thunderbird Chips exist, counterfeit or otherwise. Many people have contributed directly and indirectly to past and present research on this subject. Thanks, in no particular order, go to Gene Trimble, Howard Herz, Armin Pfaender, Jay Sands, Mike Quinlivan, Pete Klinger, Doug 'Cigarman' Smith, Scott Jaske, Don Lueders (for providing the pictures of the sample boards) and last but not least Allan Myers on behalf of KMW publishing (The Chip Rack) for kind permission to extract information from that provided in notes 003 and 004 in their publication. I welcome your comments by email.